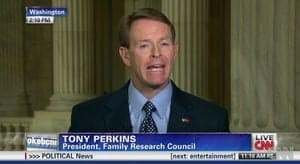 Family Research Council president Tony Perkins has spoken out against the U.S. Military Color Guard's decision to march in the Washington, D.C., Pride Parade, Right Wing Watch reports. On his radio bulletin today, Perkins argued that the Color Guard's decision discriminates against Christians because soldiers did not take part in the March For Life. Perkins claimed that the march included "half-naked people and drag queens" and stated that "while the Pentagon may be willing to bend the rules for this cause, you can bet Christian soldiers wouldn't enjoy the same 'exemption' if they wore their uniforms to the March for Life." The problem in D.C.'s gay pride parade wasn't that active duty troops were saluting the flag. The problem was which flag they were saluting. Hello, I'm Tony Perkins with the Family Research Council in Washington. March madness isn't just for basketball! After last week's gay pride parade, it applies to the Obama administration too. For the first time ever, the President authorized an eight-member military honor guard to march alongside half-naked people and drag queens. The move, which Capital Pride Parade called "significant," caps off years of being denied by the prestigious soldiers. Making matter worse, this color guard was provided by the U.S. Military District of Washington, which is reserved for the President, Congress, and other state functions. And while the Pentagon may be willing to bend the rules for this cause, you can bet Christian soldiers wouldn't enjoy the same "exemption" if they wore their uniforms to the March for Life. Unfortunately for today's troops — "equality" is a one-way street, and that street is full of activists.